With a three part special soon to be added to the Aria franchise, I'm excited to say that Aria the Avvenire is just around the corner. So I thought I'd give my two cents on one of my favourite anime of all time which is Aria the Origination, the final season of the Aria series. As with most people I used to think that sequels were generally terrible, but as of lately I've been watching anime which have pretty decent sequels in which surpass the original like Little Busters Refrain, Black Lagoon, Fate/Stay Night Unlimited Blade Works and a few others... Maybe it's just me, or maybe that myth of all sequels being terrible is just a myth. Anyways Aria the Origination does not follow that myth and surpassed/ shattered all of my expectations that Aria the Animation had already established and what Aria the Natural further solidified. 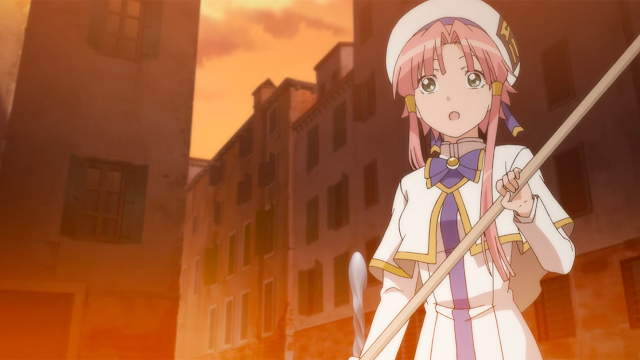 Similar to The Animation and The Natural, Aria the origination follows the gondoliers Akari, Alice, and Aika on their paths to becoming Primas. What makes this season special compared to the other two is Origination's ability to echo so many motifs that are thought provoking and endearing to the point where a lot of the messages projected in each episode holds the potential to create magnetizing affinity with many people. All of that within 13 episodes, which makes Origination the crème de la crème since many anime attempt to achieve what Origination achieved within 12-13 episodes but fail to meet the bar Origination has set so high. What assists Origination with it's powerful storytelling is the amazing character development which uses The Animation and The Natural as stepping stones to accomplish. There is a crystal clear difference between each character from Aria the Animation and The Natural leading up to Aria the Origination. Every single character in Origination serves a purpose, everyone including the cats. I really enjoyed seeing characters who we would not expect seeing spending time with each other actually spending time together to convey a message. Like the episode when Alice and Alicia spent time together - I was impressed at how Alicia was able to use Aria sachou to teach Alice about it's okay to make mistakes. To paraphrase my favourite quote from Alicia in Origination, "I would never tell Aria sachou not to do something, I'd encourage him to do whatever he desires to. Otherwise he would be afraid of making mistakes in life." In terms of animation, and sound I thought the animation was okay for 2008 standards. I felt as though the 2008 era was the tipping point where producers in the anime industry were about to add a couple of more dollars into their budget to actually animate things like water haha. None the less animation was nice. However the sound and OST remains one of my absolute favourites ever out of any OST I've heard coming out of any other anime. It's an absolute joy to listen to and the tracks are so soothing and calm, perfect to listen to when you just want to simply relax. Overall, the entire Aria franchise is an extremely calm and relaxing anime with adorable moments that just make you want to put a smile on your face. Origination is the icing on the cake. Every Aria season is something that should not be binge watched, otherwise you'd lose the whole point of Aria and get bored real quick. An episode a day should be fine to appreciate the spectacle known as Aria. It's no secret that I'm beyond excited for Aria the Avvenire since Aria the Animation, Aria the Natural and Aria the Origination were so magnificently done. That's it for this review, thanks for reading. And if you have any commentary, leave a comment below or tweet me @animedecoy!